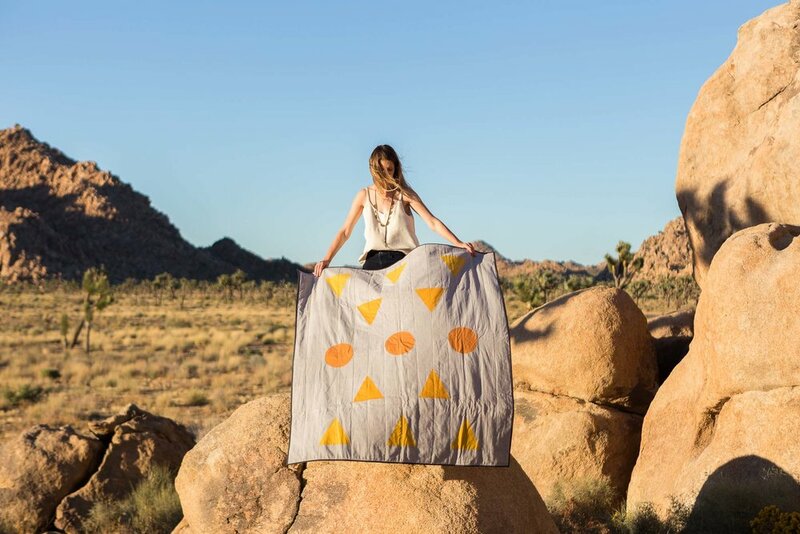 TRAVEL: Joshua Tree — Vacilando Quilting Co. It's no secret that Joshua Tree is one of my favorite places in the U.S. I've visited three times in the past 18 months, designed the Balance Collection around its landscape, and most recently got married just outside Joshua Tree. There's something about the wild desert, the otherworldly beauty of the landscape and the air of creativity that draws people there. 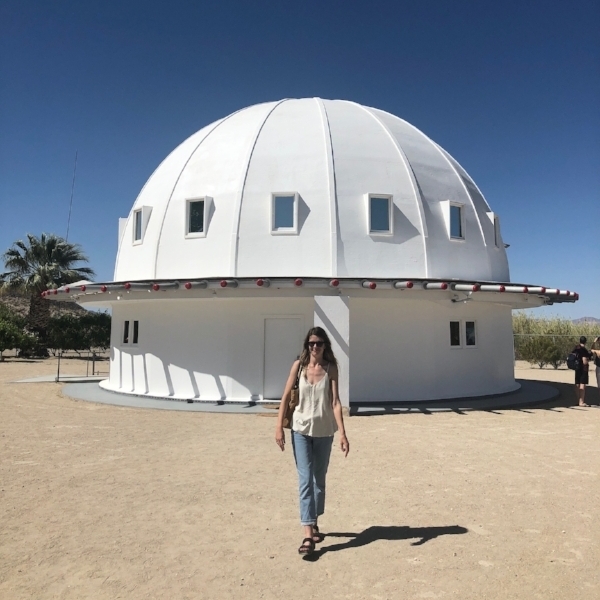 Below are some of my favorite places to stay, things to do, food + drinks, and places to shop in the Joshua Tree area. 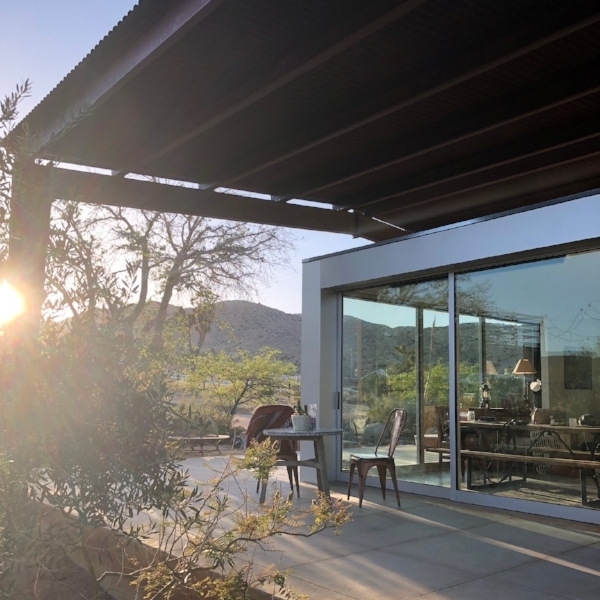 Rimrock Ranch - A handful of cabins built in 1947, a recently renovated lodge, an architect-designed modern house and a handful of Airstreams on 11 acres of magical desert in secluded Rimrock. This compound has tons of character and is the perfect place to explore and relax just outside Joshua Tree. Did I mention it's about 10 degrees cooler than Joshua Tree in the summer time? One of the many desert-chic AirBnBs - There's hundreds of AirBnBs in and around Joshua Tree, with most of them being cute, quirky and inexpensive. There's gorgeous modern homes, renovated homesteader cabins, teepees, yurts and Airstreams you can stay in, all surrounded by beautiful high desert scenery. Camping in Joshua Tree National Park - If you're more of the outdoorsy camping type, definitely try and snag a campsite in the park. You'll be surrounded by boulder piles, Joshua trees and the most incredible starry night skies. Campgrounds fill up quickly during the busy season (October - May), so be sure to book your site a few weeks in advance. Explore + hike in Joshua Tree National Park - A must see and do when in Joshua Tree. Easy hikes include scrambling over giant boulders in Hidden Valley, hiking to an oasis at Barker Dam or walking amongst the cholla in the Cholla Cactus Garden (inspiration for the Cholla Quilt!). And a drive up to Keys View is worth it for the views! Noah Purifoy Outdoor Desert Art Museum - This open air museum houses the former studio and dozens of assemblage sculptures made by artist Noah Purifoy in the 80s and 90s. Spend an hour wandering through and around his work, which is equally bizarre, unsettling, inspiring and powerful, especially with the desert as a backdrop. Sound bath at Integratron - A uniquely "Joshua Tree" experience that requires an open mind and an advanced reservation. Built in the 1970s on a powerful geomagnetic vortex, the dome-shaped building was designed to amplify the earth's energy and now hosts daily sound baths. “It’s kindergarten naptime for grown ups in a sound sphere” and well worth the trip for an hour of serious relaxation. La Copine - Fantastic elevated comfort food in an airy, hip space. It's the type of restaurant that feels casual enough to eat there everyday, but nice enough for a celebration. Sit at the counter to watch the chef prepare mouth-watering meals like Shrimp Soccarat or Fried Chicken with a spicy honey drizzle. Pie for the People! - Top notch New York pizza in the middle of the desert. This downtown Joshua Tree spot sells pizza by the slice (they're HUGE!) along with whole pies, salads and desserts. Don't be afraid of their more creative topping combos, like the David Bowie with bacon, roasted pineapple, jalapenos, Guinness caramelized onions and plum sauce - it's surprisingly delicious! Joshua Tree Coffee Company - A tiny hole-in-the-wall coffee bar that roasts their own beans and serves very legit coffee. Try their nitro cold brew and take a bag of freshly roasted coffee home as a souvenir. Pappy & Harriet's - A high desert saloon/bar/music venue/institution in Pioneertown known for their ribs, the impressive list of musicians who play there, and most recently, their long lines. If you're hoping to sit down for a meal, make reservations well ahead of time or come for lunch on the weekdays. The Station - Renovated gas station/shop in Joshua Tree with the unmistakable giant cowboy named "Big Josh" looming outside. Pick up gifts, souvenirs, snacks and a couple bottles of Wonder Valley olive oil to take home with you. Shop on the Mesa - Beautifully curated shop in Yucca Valley featuring handcrafted furniture, boho minimalist home decor and artisanal goods "for desert inspired living". Their light-as-air caftans and palo santo bundles will remind you of the high desert always. Grateful Desert Apothecary - Market and herb shop with everything and anything to cure what ails you. They offer single, blended and custom tinctures made in house as well as aromatherapy, natural body care, foods from around the world and other goods. Walking in there is a smell overload, which some love and some can't handle, so consider yourself warned. Cactus Mart - A roadside nursery and desert plant heaven in Morongo Valley famous for their 59 cent "Dig Your Own Cactus". It's not hard to spend an hour here admiring the many varieties of cactuses and succulents that line their greenhouses. Look out for the resident cats and chickens that roam free around the mart!